How old did they have to be? Reader Marian Corya was stumped on an issue of Kentucky law. Doing online research for statutes truly isn’t difficult, but it may mean looking in a number of sources to get a definitive answer — and finding those sources in places where we as genealogists don’t look often enough. You can imagine that, if there was a marriage law passed in year one and that was amended in year three and amended again in year eight, pretty soon you’d need to look at a bunch of books just to find out what the whole marriage law was in that state. So, every so often, the legislatures would order the laws codified. The codification, then, called compiled laws or codes or revised laws or whatever term is used in that jurisdiction, puts all of the marriage laws from the jurisdiction in order in one place so they can be more easily consulted and understood. And it’s those codes, filled in by the session laws between the codes, that help us get the answers to questions like Marian’s. So what I would do would be to look at the compiled laws both before and after that target date of 1857 and see if they’re the same. If they are, then chances are they didn’t change in the interim. To be 100% sure, I could also look at the session laws for each year in between the two sets of compiled laws, just as a doublecheck that the law wasn’t amended to something different and then amended back. Even if you find what you’re looking for on one of these, it’s often worth checking more than one. Sometimes a book will be digitized only on one service, and that’s where you’ll need to review it, but sometimes there’s a better copy on another service. 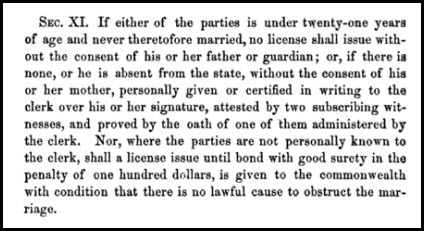 So… bottom line … how old did someone have to be to marry without parental consent in Kentucky in 1857? The answer is 21… and the law can be found to say so. Thank you! This will undoubtedly be helpful in other states and time periods as well. At least the Kentucky statutes are available and easy to use. Colonial Georgia and British West Florida laws and statutes present a far more interesting challenge. How old did a woman have to be to marry without her parents or her guardins consent in Kentucky in the year 1807. I know a man was 21 but I’ve heard that a woman could marry at 18 without a “letter of consent” from her parents or her guardians. You’ll find your answer in the laws of Kentucky at the time (hint: do a Google Books search for The Statute Law of Kentucky: 1798-1801).